DETROIT (CNS) — The next phase of Catholic media is filling mailboxes across the Archdiocese of Detroit, and it’s all part of a continuing mission to make and build up disciples of Jesus Christ. Starting this week, Unleash the Gospel Magazine, an all-new print periodical from the Archdiocese of Detroit, will be arriving at an estimated 90,000 homes across southeast Michigan. The magazine is the latest effort in the archdiocese’s conversion from “maintenance to mission” in response to an archdiocesan synod in 2016 and Detroit Archbishop Allen H. Vigneron’s 2017 pastoral letter — also called “Unleash the Gospel” — which called for the archdiocese and its parishes, schools, ministries, families and individuals to rethink how they live their vocation as witnesses to Jesus Christ. Edmundo Reyes, director of communications for the archdiocese and executive editor for Unleash the Gospel Magazine, said the magazine’s launch — and the launch of a newly redesigned partner website at UnleashtheGospel.org — is part of the archdiocese’s greater plan to form and equip Catholics to carry out the saving work of Jesus in bold and creative ways. Detroit Catholic is the archdiocese’s online news service and can be found at detroitcatholic.com. On Dec. 11, 2018, the archdiocese launched new social media channels — @utgdetroit on Facebook, Twitter and Instagram — under the Unleash the Gospel flagship, including inspirational content and testimonials from Catholics across the archdiocese on how they are living as Christ’s disciples. Unleash the Gospel Magazine and UnleashTheGospel.org are a continuation of that effort to foster a sense of discipleship among Catholics that crosses age, racial, social, geographical and parochial borders, said Christine Warner, the magazine’s editor-in-chief. Unleash the Gospel Magazine is filled with features highlighting Catholics in southeast Michigan, written predominantly by local writers and supplemented by local photography to give the magazine an authentic “Detroit feel,” Warner said. The theme of the magazine’s first issue — “Hope. Rebirth. Renewal.” — takes inspiration from the motto of the city of Detroit: Speramus meliora; resurget cineribus (“We hope for better things. It shall rise from the ashes”), which was penned by Father Gabriel Richard, who is called “Detroit’s second founder” for his efforts to rebuild the city after the great fire of 1805. “When we were discussing this magazine, it was clear to us that this first issue had to be about hope, renewal and rebirth,” said Reyes, one of the magazine’s two executive editors along with Father Stephen Pullis, director of the archdiocese’s Department of Evangelization, Catechesis and Schools. “This is a season of renewal and rebirth now in the archdiocese. 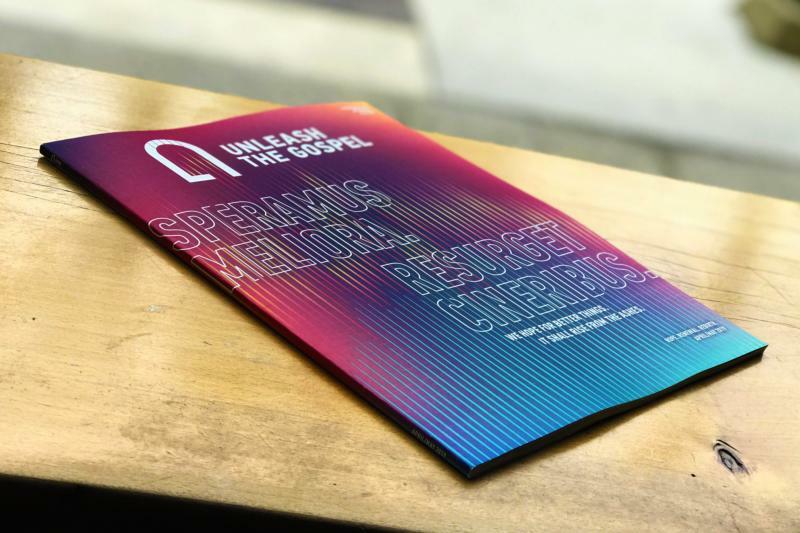 The redesigned UnleashtheGospel.org will feature all of the content in the magazine for free, as well as additional stories, photography and video content. The site also will continue to be a place to learn about “Unleash the Gospel” and “how to join the movement,” Reyes said. It will host a print and audio version of the pastoral letter, in addition to Archbishop Vigneron’s pastoral notes and reflection guides. Whereas Detroit Catholic serves as the archdiocese’s news publication, reporting the news and happenings within the archdiocese’s schools, parishes and ministries, Unleash the Gospel Magazine is a faith formation and evangelization resource, Reyes said, a model to help readers learn how to become Catholic evangelists. More than 90,000 people, including lay faithful, clergy, and those who have supported the mission of the Archdiocese of Detroit and have contributed to the annual Catholic Services Appeal in recent years, will receive the print magazine as a stewardship gift in gratitude for their support, said Reyes, who added that no funds from the appeal are used for the new magazine. said. Anyone who wishes to receive a hard copy of Unleash the Gospel Magazine is invited to support the mission of the archdiocese and make a gift to the appeal and receive the next issue, Reyes added. Reyes said the idea behind Unleash the Gospel Magazine is to be more than just a Catholic publication, but a way to build community among readers — a centering focus of a great movement. The magazine will be published every two months, with four more issues expected in 2019. Each issue will feature a unique theme, cover to cover. Meloy is a staff reporter at Detroit Catholic, the online news service of the Archdiocese of Detroit.